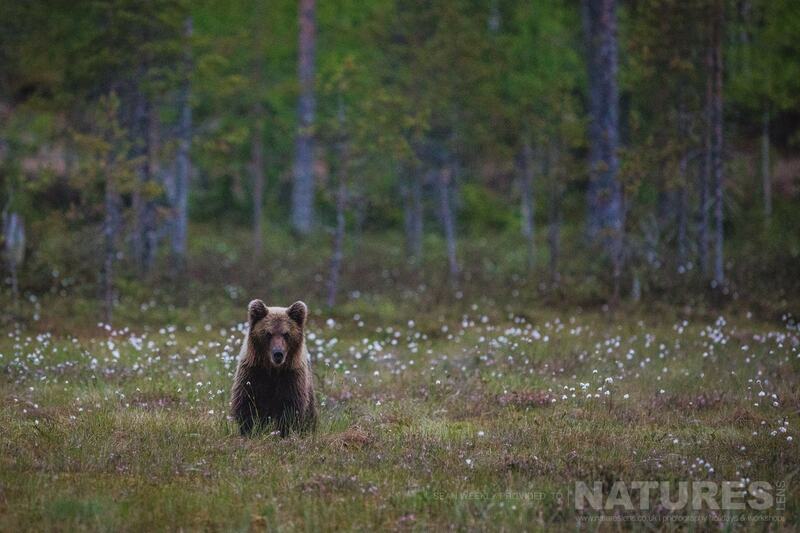 Everyone was in the hides from around 6 pm onwards through until 7 am the following morning. 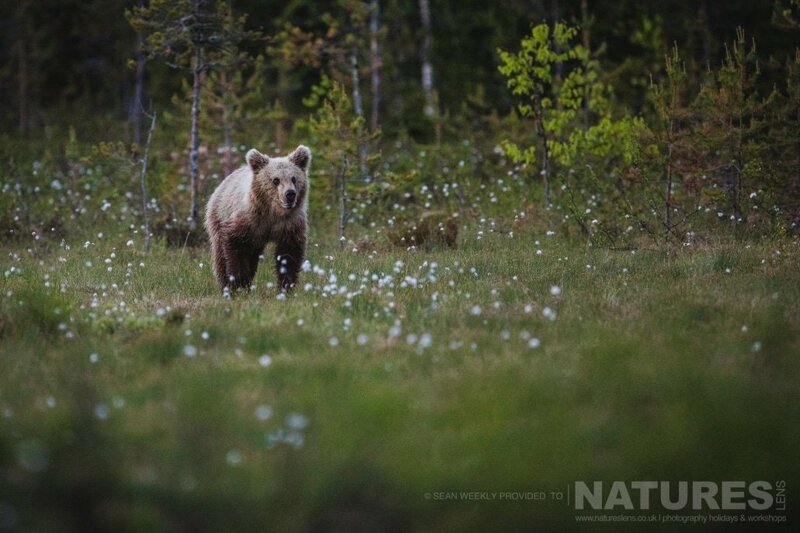 The trip was timed perfectly to get the advantage of 24 hours of sunlight during the midnight sun. That phenomenon, known as The Midnight Sun, is caused by the tilt of the Earth’s axis in relation to its orbit around the sun, as a result, at both North & South poles, the sun only sets & rises one day every year! 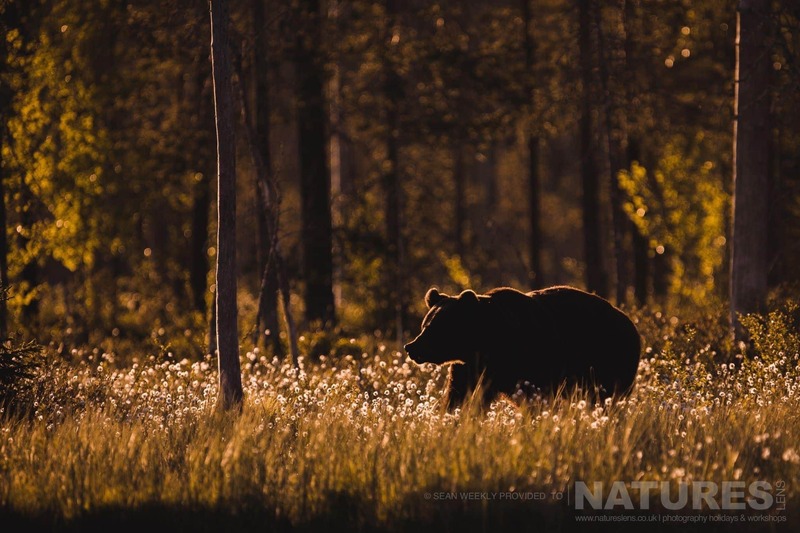 In Finland, the summer months of June & July are the months where the Midnight Sun is at its peak. When nights are still relatively light as it is possible to photograph all night long. 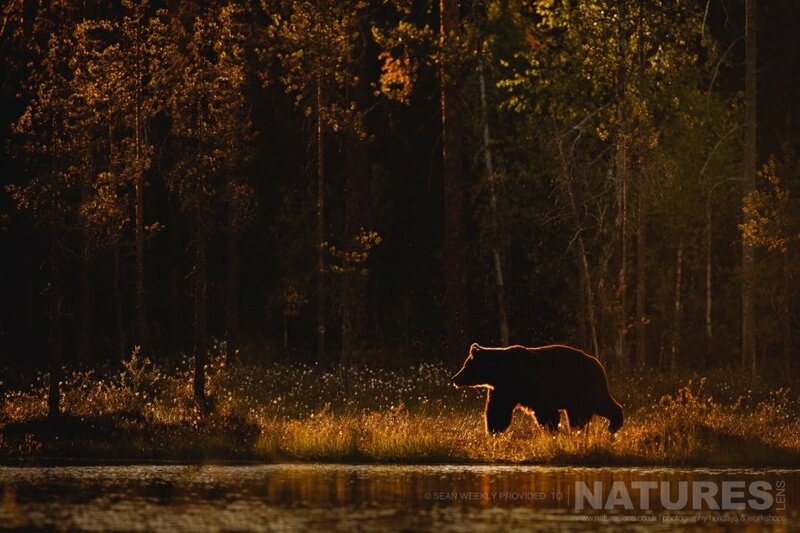 The biggest difference from shooting at night comes from the incredible change in the nature of the light. The sun takes on a reddish-yellow colour, almost like during sunrise or sunset & everything around you is bathed in an unimaginably warm, bright light pretty much a photographers dream! 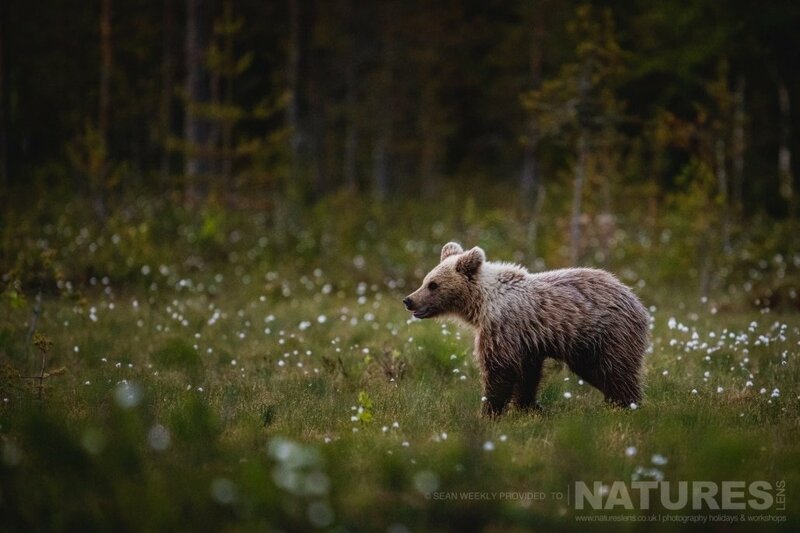 Our first night in the hides took its toll on the body clock but the thought of waiting to see one of the wild Brown Bears was more than enough excitement to keep you alert & awake. 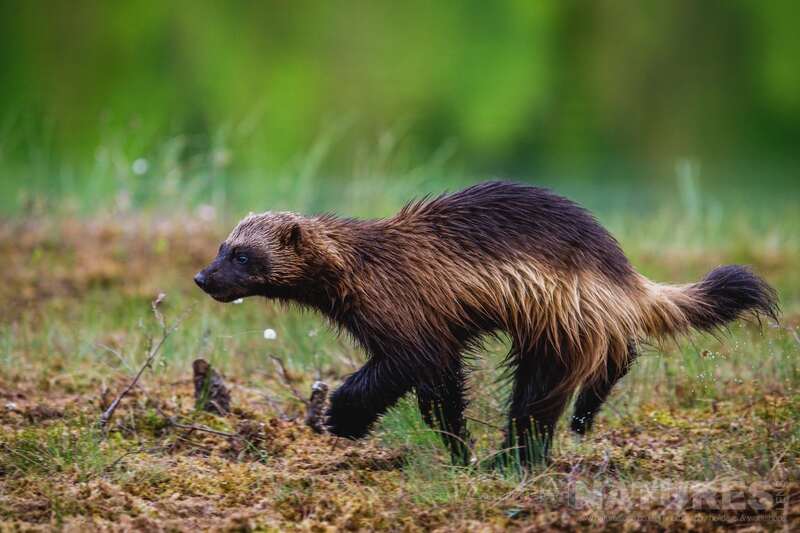 After a few hours of waiting, we got our first glimpse of a wolverine although some distance away on the other side of the lake it was amazing to see this elusive animal. 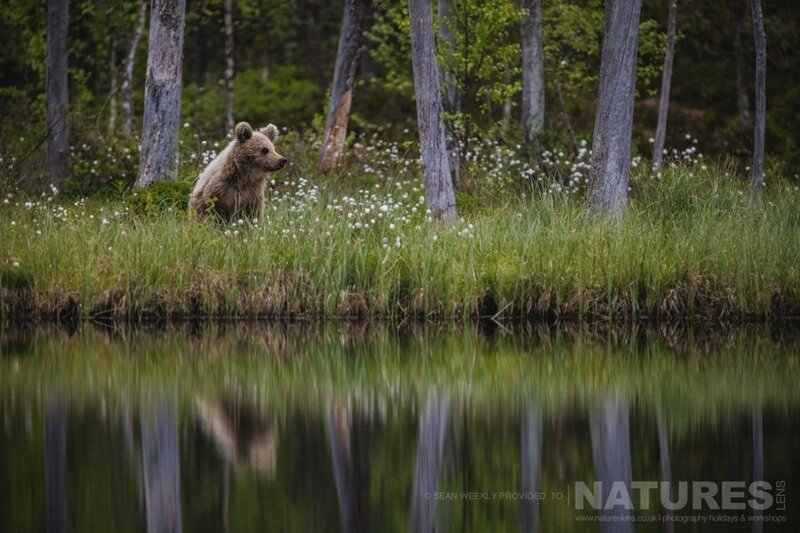 An hour later our first bear appeared, emerging from the deep woodland to the right of our hide walking slowly & sniffing the air around him. It didn’t take long for him to come into the feed station that was around 15 metres from where we were. 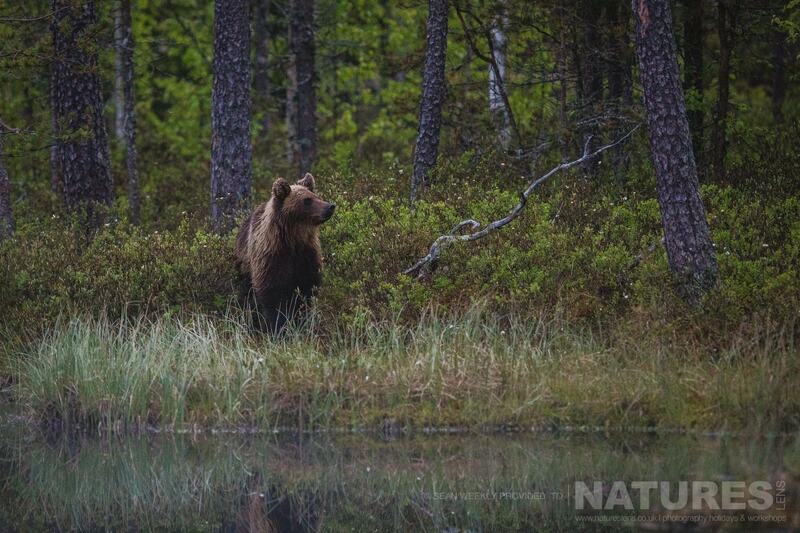 For anyone who hasn’t experienced seeing a bear in the wild, it is almost a heart stopping moment. An absolutely amazing feeling that certainly gets the adrenaline going. 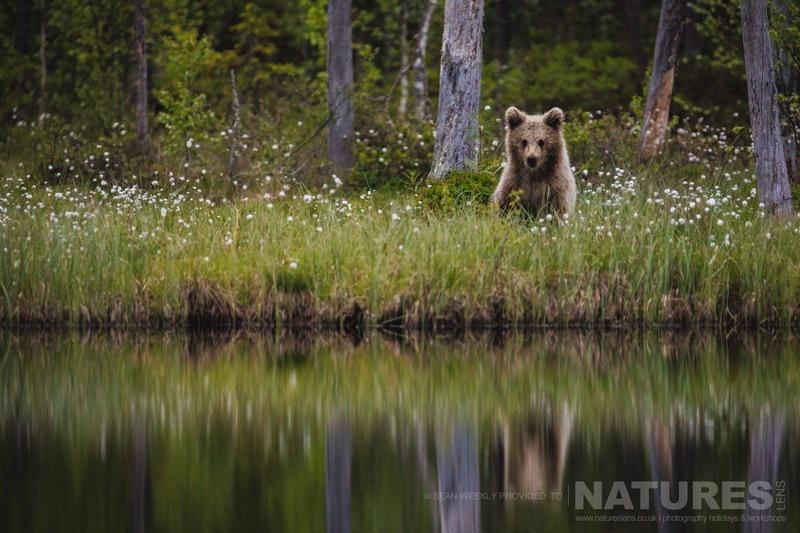 The large male Bear stayed in & around the hide for a short time before making his way back to the safety of the forest. The rest of the trip followed the same format, we arrived back to the lodge around 7:30 am had a great breakfast then got some sleep before we were up again for the next hide session. There were a few hides that overlooked another lake, however, this lake was quite narrow allowing for some great opportunities on the opposite side. As always it was just a waiting game for anything to show. 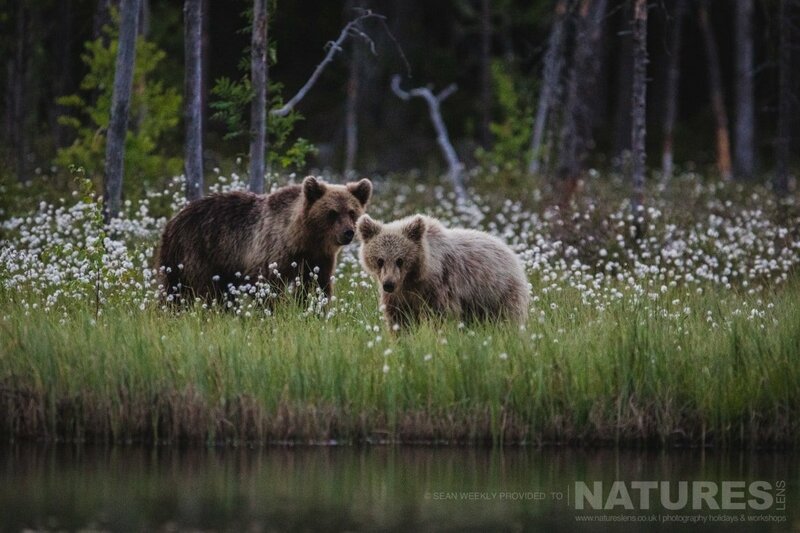 It was not a disappointment though, as 3 Bears turned up that evening. One individual male & pair of both male & female. 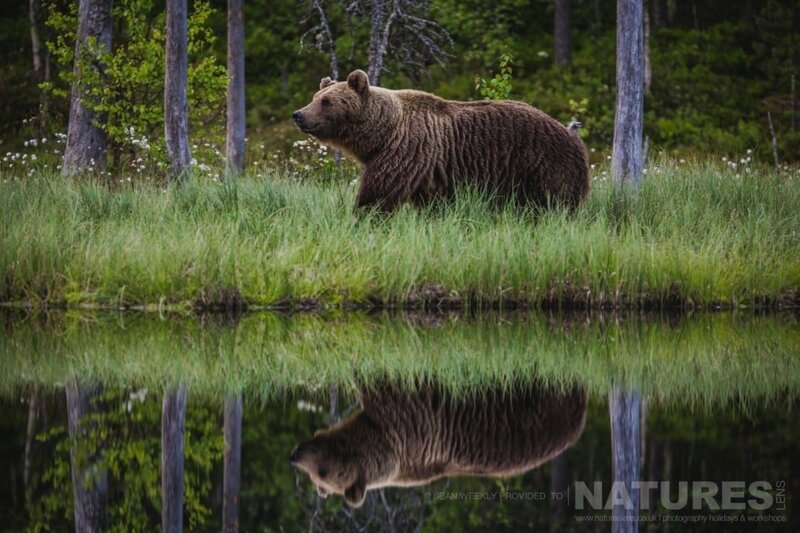 This allowed for some amazing close-up reflection images that would have been very difficult to get anywhere else! The best evening for me was on the second to last night where I was blessed with some truly stunning light. This allowed the photographers to get creative & come up with some unique & original shots. 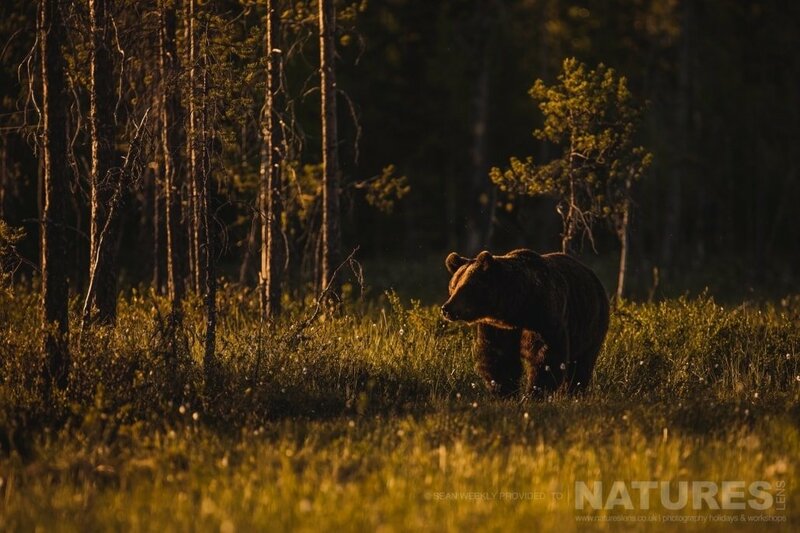 For me, the light of this night along with great bear activity made this one of the best sessions of the trip. An amazing experience & one I am so privileged to have been a part of. 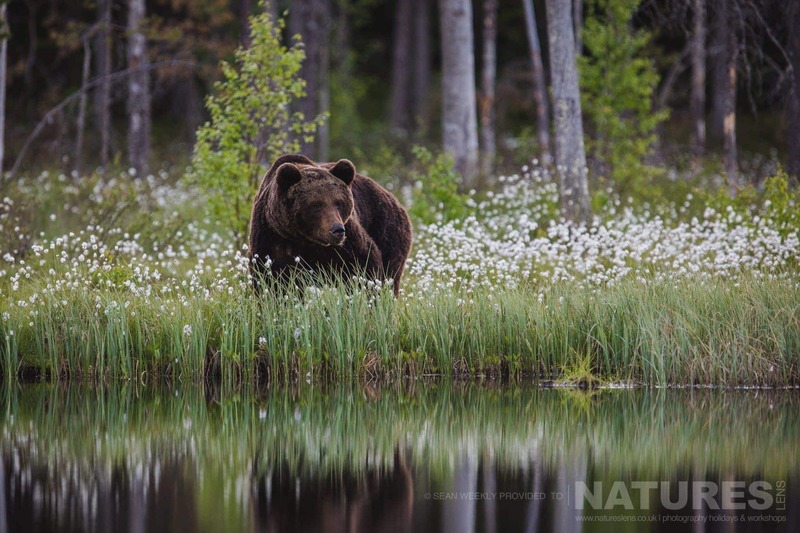 WOULD YOU LIKE TO CAPTURE IMAGES OF THE WILD BROWN BEARS OF FINLAND FOR YOURSELF? 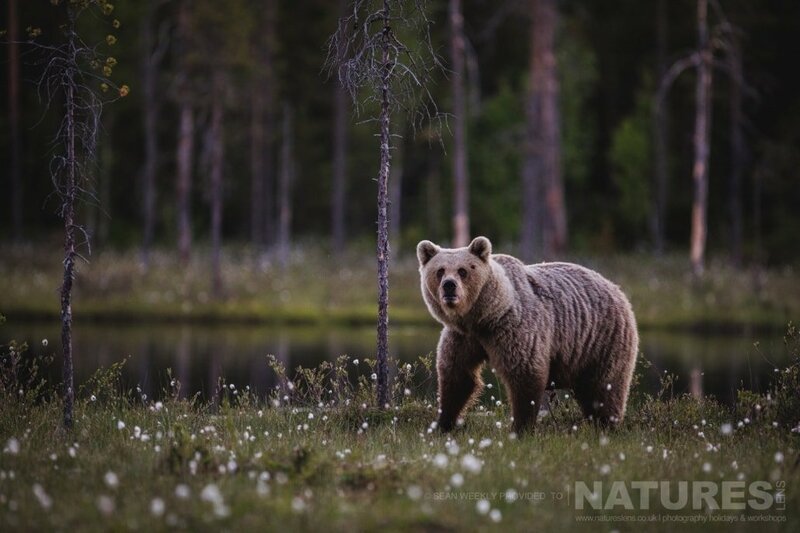 The Wild Brown Bears of Finland Photography Holiday costs £1099 each participant (until 31st October 2017, £1199 each participant thereafter), this price excludes air travel to Kajaani itself – all ground transportation from Kajaani & back, food, accommodation & guidance/tuition is included. 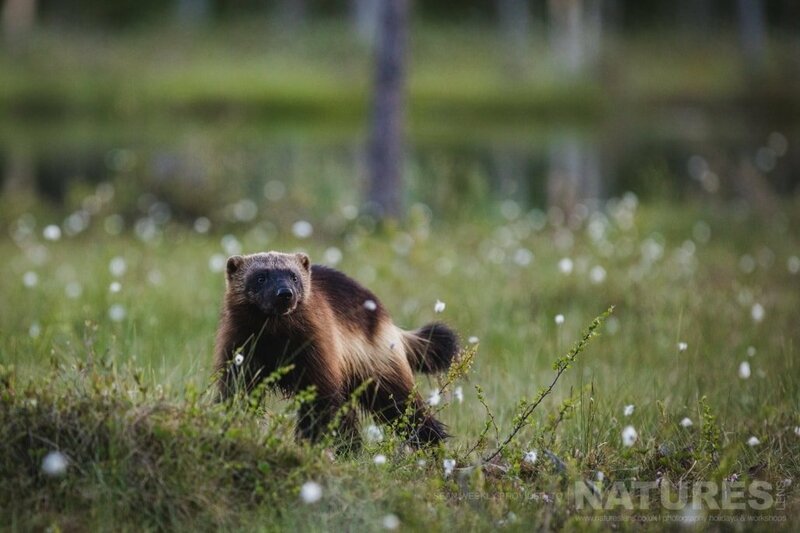 This entry was posted in galleries, finland, worldwide tours and tagged brown bear, finland, midnight sun, wolverine. 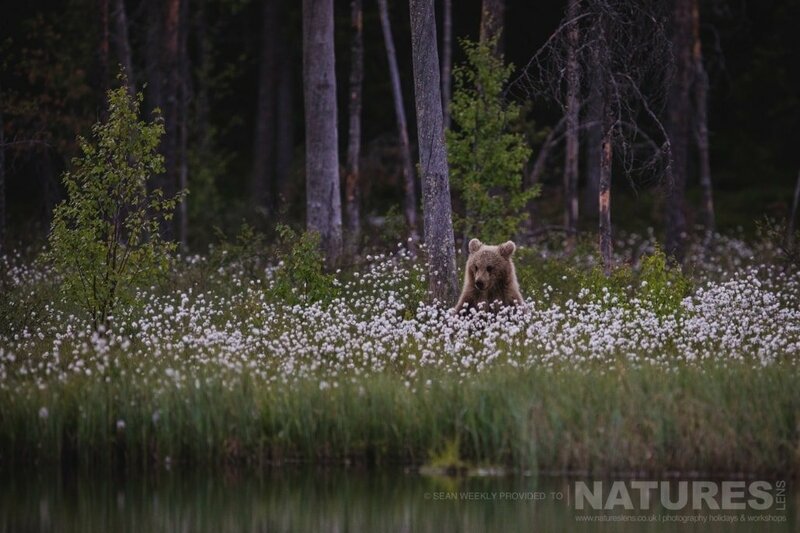 Whatever your query regarding our photography holiday, The Wild Brown Bears of Finland, please fill out your details below & we will get back to you.